In December 2014, the city of Cuenca celebrated 15 years of being included in the World Cultural Heritage list of UNESCO. Located in a valley in the middle of the Andes, the city has been full of diversity and resources exploited by various civilizations that, throughout history, formed the rich cultural city, which Cuenca has been recognized. Each generation has left a mark that contributes to what we perceive today in the city: the urban plan, streets, houses, squares and parks as well as the various traditions, popular phrases, parades, food, etc. Currently, in many places around the world, the evolution of cities means, most of the time, pressure on their historic centres, where their richness could be at risk. In the case of Cuenca, urban development, socio-economic changes and certain new elements built into the landscape, have been diagnosed as major causes necessary to consider a broader view of heritage conservation management. As for urban development, Cuenca is the third largest city in Ecuador; it has experienced a population increase, which led it to a series of changes that never have faced before. According to the last census (2010), the city of Cuenca has a population of 505.585 inhabitants which represents a substantial increase from the 1950 census where the population was 122.434 inhabitants. According to an analysis done by the Municipality through the Department of Historic Areas (2009), with respect to land use, housing remains the main use in the city centre. However, its distribution is not evenly spread in the territory, where economic activity is concentrated around the central square, markets and certain streets. In addition, various activities are being strengthened, especially tourism which have suffered some changes during the last decade due to the promotion of Cuenca as a World Heritage City. Taking all these issues as a starting point, the School of Architecture of the University of Cuenca has initiated the project Reassessment of the Cultural and Natural Heritage of the city of Cuenca from the strategies of sustainable development supported in the figure of the Historic Urban Landscape (HUL_C) in order to work on implementing the HUL figure in the city of Cuenca. These efforts joins the Agreement signed between the WHITRAP, the Municipality of Cuenca and the University of Cuenca with the immediate tasks of supporting research in progress, the development of Visionary Conference held last May and the publication of their results. Ballarat, in the State of Victoria, is one of Australia’s most substantial and intact mid-19th century historic cities, which was established during the gold rush in the 1850s that saw an important mass migration of people in Australia. Ballarat’s urban heritage and diverse community currently comprises over 10,000 places in the local heritage overlay, over 60 heritage places listed on the Victorian Heritage Register and one heritage place on the National Heritage List. Next to this level of protection afforded to its built heritage, it also has strong statutory legislation in the form of a State Government Act to protect sites of Aboriginal Cultural Heritage, in particular that of the Wadawurrung and Dja Dja Wurrung people, the traditional custodians of the land. The city is well-known for its heritage-focused strategy, ‘Preserving Ballarat’s Heritage’, which uses many of the tools listed in UNESCO’s HUL Recommendation of 2011, such as capacity building and community engagement, as well as a level of financial and other institutional support available to its community. 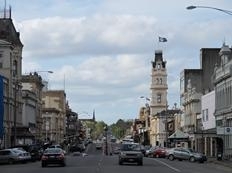 In 2010 the Planning Institute of Australia recognized the quality of the City of Ballarat’s heritage-related work with an award for planning excellence for its “Preserving Ballarat’s Heritage” Strategy. For this innovative strategy the Heritage Council of Victoria awarded Ballarat with the Heritage Council Award in 2011. While the key focus to date has been on historic built post-colonial settlement heritage, the City is now working towards the identification and inclusion of a broader range of values that make up Ballarat’s cultural heritage. Rawalpindi is a city with a dense layering of historic and cultural values, primarily expressed through traditions, customs and community practices in the old neighborhoods with a diverse physical and social fabric. The old core of the city is a densely packed area of bazaars and mohollahs, which have developed organically, meaning without any formal planning, creating an enduring and resilient pattern of urban life. This pattern emerged in its earliest formation and can still be clearly read in contemporary Rawalpindi. It bears testimony to a heritage and tradition where Hindu, Sikh, Jain, Muslim and Christian religions and cultures met and coexisted, expressed in the great variety of religious buildings of different faiths, the complex of traditional bazaars, the many languages, worship and religious festivals, arts and music, food, and daily practices. The old city retains a significant amount of residential and commercial architecture from the 19th and 20th centuries in which no two buildings seem to be the same in design or decoration. They form a yet-to-be studied compendium of decorative forms, combining western and oriental materials and design vocabulary. The flat skyline of Rawalpindi is punctuated at intervals with the domes and shikhar of Hindu temples and the minarets of mosques. Each is distinctive and acts as a geographical marker that represents its locale and assists the people of the city to navigate through the dense maze at street level. 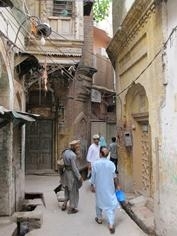 The pattern of bazaars linked to adjacent mohollahs by narrow twisting pathways forms the unchanging framework in which life has been lived in Rawalpindi over the centuries. 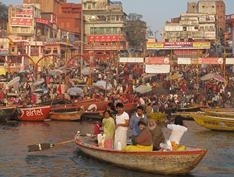 It is quite remarkable that despite the lack of any formal, large scale planning over the last 5 decades there is still a vibrant functioning core of the city, which given infrastructure deficiencies, traffic congestion and high population density, is based primarily on socio-cultural capital. The extent of Rawalpindi’s cultural‐historic significance, however, is still poorly understood, let alone recognized, and cultural mapping exercises and surveys are shedding more light on this aspect of the city. Since the start of 2013 WHITRAP has been working with the National College of Arts (NCA), Rawalpindi Campus, in developing a HUL Pilot Project for the historic core of Rawalpindi. Funded under the Netherlands Funds-in-Trust at UNESCO and within the framework of the application of the HUL approach, staff and (former) students of NCA have been conducting activities related to the six steps suggested in the HUL Action Plan. These include a comprehensive documentation of the city’s natural, cultural and community resources; creating an understanding of its values and cultural-historic significance; and assessing vulnerabilities of these resources. Furthermore, consultations have been undertaken at ministerial and governmental levels, including the Pakistan Planning Commission, Pakistan Planning and Management Institute (PPMI) and the federal Ministry of Planning and Development and Reform, which resulted in providing input on the HUL approach in sustainable urban planning and development as part of the ‘Vision 2025’ document that is currently being formulated at the national level – an extremely important step meaning that the Historic Urban Landscape approach is now an integral part of the national planning agenda. All this was sealed on 7 February 2014 in a tripartite Strategic Cooperation Agreement that was signed between the District Coordination Office (DCO) of Rawalpindi, the National College of Arts (NCA) in Rawalpindi and WHITRAP in Shanghai. 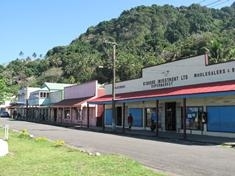 The Historical Port Town of Levuka was inscribed at the 37th Session of the World Heritage Committee in 2013, in Cambodia, as Fiji’s first World Heritage site. As part of the nomination process the Historic Urban Landscape approach had been applied to identify the layering of values and determine the site’s significance. During consultation meetings with National Authorities, at the 5th Pacific World Heritage Workshop in Suva (Fiji) in November 2013, the inclusion of Levuka as a Pilot City in WHITRAP’s Special Programme on HUL was discussed and currently a Strategic Cooperation Agreement is under development. One of the first activities to be jointly organized is a national training course on the development of a Conservation Plan for Levuka under the umbrella of the Historic Urban Landscape approach, scheduled for September 2014 and funded jointly by WHITRAP and the Netherlands Funds-in-Trust at UNESCO. The primary aim is to raise awareness and train local resource persons in the application of UNESCO’s Historic Urban Landscape approach as an integral part of the Conservation Plan development and its implementation. Since September 2011 and under the umbrella of a Memorandum of Understanding between UNESCO and the World Bank, signed in July 2011, the concept and approach of the Historic Urban Landscape has been incorporated in an Inclusive Heritage-based City Development Programme (IHCDP) implemented in India with funding support from the Multi-Donor Trust Fund for Cultural Heritage at the World Bank, Washington DC. The IHCDP constitutes a demonstration programme of the World Bank and is being implemented with the collaboration of three Indian ministries, being the Ministry of Housing and Urban Poverty Alleviation (MoHUPA), the Ministry of Urban Development (MoUD) and the Ministry of Culture (MoCul) under supervision of the Department of Economic Affairs (DEA). A Steering Committee made up of staff and officials of these three ministries is headed by the Joint Secretary at the Ministry of Urban Development. Under the demonstration programme, technical assistance is being provided to three municipal authorities, Varanasi, Hyderabad and Ajmer-Pushkar. The development of Detailed Project Reports (DPRs) for these cities pertain to local project sites where, through targeted investment and development interventions, heritage assets will be rehabilitated and upgraded with the aim to safeguard the asset, increase visitor and revenue flows, and improve local livelihoods. The selection of project sites is based on inventories, identification and evaluation of heritage assets (tangible and intangible), stakeholder consultation and participation, and socio-economic analyses (identifying local community needs in terms of amenities, services and job creation). Phase I of the demonstration programme ended in June 2013 and a follow-up phase is currently under development.